I thought that I would start the year with a sobering thought, it’s healthy to occasionally face up to reality and of course to realise that you humans are not the super race you seem to believe you are! I don’t suppose that many of you super human humans know that the human brain has been shrinking for the last 20,000 years and the really bad news is that this decrease in the size of humans brains follows two million years of steady growth in the size of the human cranium. And don’t think for a moment because you are a man or a woman or you come from somewhere that seems to breed bright very intelligent people you can escape this problem because the incredible shrinking of human brains is happening all over the world, to both sexes and every race. Fortunately I can confidently predict that you humans have a lot of time left to be the super race that you so enjoy being but you all are obviously going to have to be careful of a another race that already gives you taller animals a run for you money – The Cat and of course this Cat in particular! 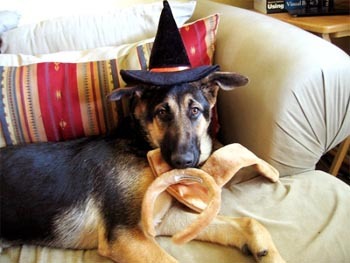 The good news is that some scientists believe that humans will never become as daft as – oh say a German Shepherd Dog. Indeed some scientists have recently said that the human brain may have stopped shrinking and started to get bigger, which is all very well and good for your children’s children’s children but doesn’t say much for the humans kicking around at the moment, which I believe is err one up for Cats again. 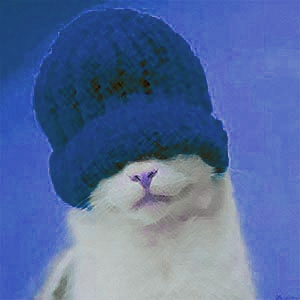 There are some exceptions to the rule that Cats are very intelligent and as an example I give you – Dave The Cat, founding and only member of the ‘Bobble-Less Hat Club’ sporting his latest bobble less hat, bless him! If you didn’t read yesterday’s blog because you had accidentally locked yourself out of your house, unfortunately trapped your head in some railings or had to call out the Fire Department to help rescue a Cat from a tree you probably missed my wish that all my readers have a wonderful New Year so here it is again. 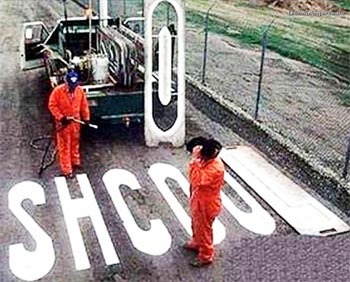 First I would like to say that this is the third or fourth ‘PS’ in a row in my blogs recently I think, and that is in my opinion three or four ‘PS’s’ too many but here is an important PS anyway! The ‘Bobble-Less Hat Club,’ founded by someone who calls himself a friend of mine, is looking for new members and if you are interested in joining then do drop me a line at my usual and of course unique email address thecat@thecatsdiary.com or you can do the same through the contact form on my wickedly wonderful website – www.thecatsdiary.com. Actually I wanted to say that the ‘Bobble-Less Hat Club’ was ‘desperately’ looking for new members but the founding member, chair Cat and general Dog’s body (a term he still hasn’t quite grasped) asked me to delete the word ‘desperately’ because he thought that it sounded as though the club was having problems recruiting new members! The founding member, chair Cat and general Dog’s body qualified this statement by saying that he hadn’t had any trouble at all joining this excellent club when he joined! Sometimes I worry about Dave the Cat and then other times I don’t, those are the times when I decide that he is really happy being Dave the Cat and we should be pleased for him too!